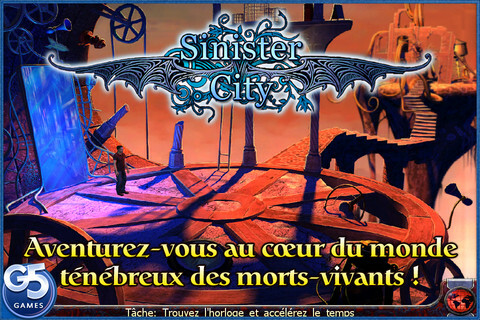 Sinister City : dig in! 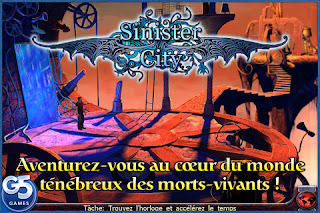 SinisterCity is a well-made, albeit classic hidden-object game for iOS, with an HD iPad version. The first part serves as a free demo and you unlock the rest for 5$. The iPad graphics are gorgeous, perfectly conveying the gothic, spooky feel of the eponymous sinister city; and despite the dusky lighting, the very-discernible objects won't make you squint to see them. The electronic, over-saturated, high-pitched notes of the music let a feeling of uneasiness sink in, rounding up the aesthetics. Items that needs to be pushed aside to reveal another one don't really jump at you; but, on the normal difficulty setting, hints are quick to recharge, so you're rarely ever-stumped; in the end, this plays more like an interactive scene. The plot is pretty easy to fathom, but the atmosphere is so spooky, it is nonetheless entertaining. If you like hidden-object games and gothic settings à la Mystery Case Files : Ravenhearst, this is a pretty good pick. Also note that G5 Entertainment, the developer, has a couple of other games in the same genre and ambiance.